Pulling away from the dock at Centre Island in the Toronto, Ontario in Canada, the Toronto Islands Ferry continues on its daily route. The ferry transports passengers between a small chain of islands in the city which are located a short distance offshore from the downtown core. Centre Island is the largest of the islands, originally beginning as a sand spit which extended 9 kilometers into Lake Ontario. Each of the islands has its own characteristics and recreational attractions for visitors and is still a community of 262 cottages. 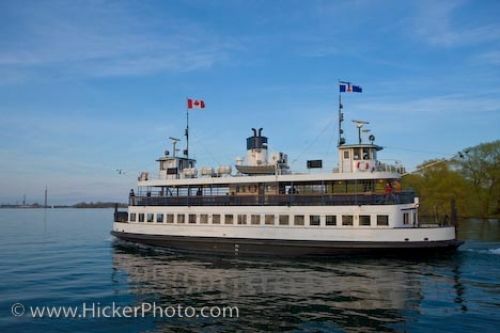 The ferry travels on different routes across Lake Ontario, one of the only forms of travel besides water taxis, to the Toronto Islands. Toronto Island's Ferry departing Centre Island, City of Toronto, Ontario, Canada. Picture of the Toronto Islands Ferry leaving Centre Island in the City of Toronto in Ontario, Canada.